There were plenty of winners and losers this week, with a hardwood flooring retailer walking the plank after a report called out the safety of some of its products and the leading consumer electronics retailer serving up encouraging financial results. Shares of the satellite radio monopoly hit new 52-week highs after raising some debt at a low rate. Sirius XM was supposed to issue $750 million in debt this week, but strong demand resulted in it clearing $1 billion in new financing. The new senior notes will mature in 10 years, paying an annual rate of 5.375 percent. It's a slick move by Sirius XM. It can turn around and use those proceeds to either pay down earlier debt that matures sooner with higher rates or buy back its stock at an attractive financing rate. Either way, Sirius XM comes out ahead. The leading retailer specializing in hardwood flooring walked the plank after a scorching "60 Minutes" segment. Sunday night's show tested laminate flooring from leading merchants, finding all 30 of the Chinese-made laminates sold at Lumber Liquidators to be high in formaldehyde. You may recall formaldehyde from biology class when you dissected a preserved frog, but it's also used in moderation in flooring. The problem is that it's also a potential carcinogen, and the Chinese samples contain levels that are above accepted limits. Lumber Liquidators scheduled a conference call for next week to provide a business update, and it is expected to discuss the situation. It also bowed out of presenting at the Raymond James' annual Institutional Investors Conference on Wednesday. Even if it's able to cut ties with the Chinese suppliers, it will take some time for its reputation to recover. At least one supermarket chain is cleaning up these days. Kroger shares hit fresh highs after it posted blowout quarterly results. The chain of more than 2,600 grocery stores came through with a profit of $1.04 a share, well ahead of the 90 cents a share that analysts were forecasting. Revenue also landed ahead of expectations, climbing 9 percent to $25.2 billion on the strength of a 6 percent uptick in comparable-store sales excluding fuel. The near-term outlook is similarly bright for Kroger. It sees profitability clocking in between $3.80 a share and $3.90 a share. The market was holding out for just $3.72 a share. The Fresh Market is backing out of a key market. The high-end grocer revealed on Thursday that it will be closing all of its stores in California. The chain of small-box supermarkets specializing in premium products will be taking a charge of $20 million to $26 million to shutter all of its stores in Palo Alto, Laguna Hills and Santa Barbara. The Fresh Market will focus on growing its chain on the East Coast, where it has had more success. It makes sense to put more effort on the markets where its high-end niche concept is working, but any retreat is still ultimately a retreat. 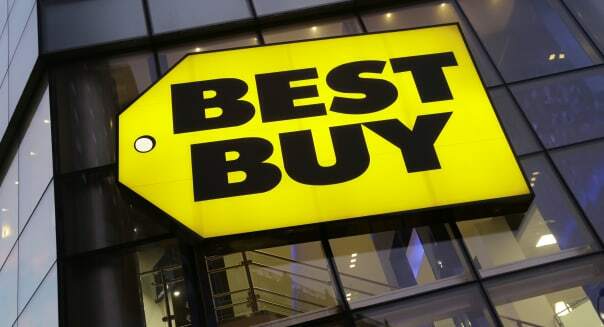 There are signs of life at Best Buy. The leading retailer of consumer electronics posted positive store-level sales growth in its latest quarter. It also saw earnings grow even faster, proving that it was able to grow sales without sacrificing margins. Best Buy isn't painting a very upbeat picture of the next few quarters given the competitive nature of the business, but it's rewarding shareholders through a dividend hike and a commitment to aggressively buy back stock. Motley Fool contributor Rick Munarriz has no position in any stocks mentioned. The Motley Fool recommends Lumber Liquidators and The Fresh Market. The Motley Fool owns shares of Lumber Liquidators. Try any of our Foolish newsletter services free for 30 days. Looking for a winner for your portfolio? Check out The Motley Fool's one great stock to buy for 2015 and beyond.